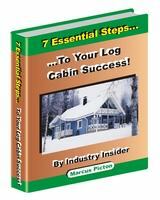 Log Cabin Foundation Details – Longevity, damp & cost! Well other log cabin foundation details are crucial, so we must understand what factors affect cost and also what may cause problems in this environment. Whilst some are more obvious, some things which contribute to deterioration over the long term can go unnoticed. The bottom line is, your foundations must last! Damp proofing and measures to deal with moisture play a key role here and we will cover the most important areas to focus on here. Also the overall cost plays a huge part in the decision making process. However never be tempted to use cheap but poor foundations, the cost saving will be spent many times over if you need to remedy a foundation problem later on! Make sure all your log cabin foundation details are right! Foundations are often an area which can be overlooked but are crucial! You also need to ensure that the foundations your log cabin sits on, will outlast the log cabin itself! To save a little money by installing poor foundations is false economy and must be avoided at all costs! Remember a problem with foundation on a finished building, becomes a massive problem to solve. I have seen expensive log cabin sitting on timber posts pushed into the ground and frankly is amazes me how short sited some people are! Make sure that your log cabin foundation details are all correct therefore to ensure its longevity. How long a foundation will last is largely down to 2 things. The first and most obvious is the actual materials used. The second one is sometime glossed over, but the design and installation of your foundations also need to be done correctly. The ground is an unforgiving environment and constant contact with soil must the dealt with properly. The materials then which can be used do vary depending on your log cabin. Commonly used on more substantial log cabin are concrete, masonry bricks and blocks, other types of stone, timber and metal work. On smaller cabin plastic may also be used too! Now materials which will deteriorate in this environment, need to be treated or finished in such a way which stop this from happening and/or installed in a method which keeps potential problems away i.e. moisture and damp. For timber this could mean using properly treated wood, whilst for metal work this may mean galvanizing or other anti-corrosive finishes. So why is damp proofing and dealing with moisture so important for log cabin foundation details? Well timber does not like be in constant contact with water and so precipitation and ground water must be dealt with effectively. Timber is frequently used in certain types of foundation designs and this must be protected to stop any future decay. As your log cabin is also timber and problem with the foundations could affect the overall structure and the base logs are always the most vulnerable in this respect. This is also why your base logs should be well above the surrounding ground level. Our foundation accuracy section shows what are the recommended minimum distances, to minimize the affects of rain splash and moisture absorption. Damp proof coursing must be employed to ensure that no moisture is transferred upwards from the foundations to the logs themselves. We also need to make sure that any water falling as rain does not get trapped where the foundations meet the logs. Thus preventative measure already described in this foundation section must be undertaken. Problems in this area which result from poor design and construction, often go unseen until the point at which real damage has already reached significant levels. Needless to say remedial action to rectify this is both very difficult and expensive! This is probably the most scrutinized are of log cabin foundation details, the price! Costs will vary quite dramatically depending on the foundation type and design. However as we have mentioned before compare very carefully when you look at different types of foundations! The only way to really make sure you are comparing properly, it to combine the foundation and floor structure elements together to see the big picture. Some foundation types will by their very nature contain the floor structure with the foundation themselves i.e. concrete slab. 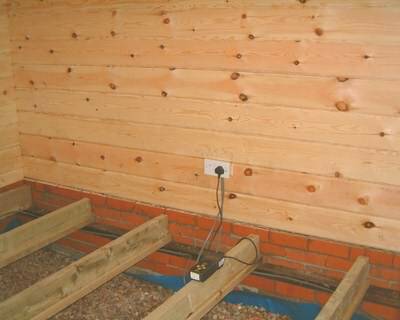 Other foundations will provide support for the log cabin walls, but once completed will not have a floor structure i.e. perimeter founds with timber floor joists. 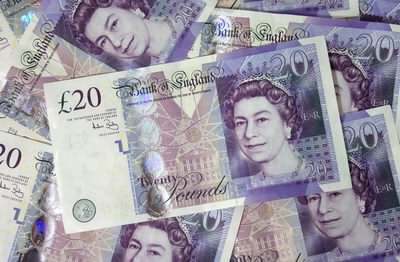 The cost saving on the foundations of the latter method, may well be offset by the additional time and labour costs of installing the floor joists afterwards. In fact the very best way to compare different types of foundation is to look at the installed cost, up to the stage your are ready to put down your finished floor covering. This way everything from foundation, floor structure, insulation and any other boarding below the finished floor is included. Labour is a very important element not to forget in all of this. Whilst materials play a large part of the cost in this part of a building, the labour cost is also quite major. So always remember to put this into your calculations when comparing and working out costs. Some methods are much more labour intensive than others and so looking at material costs in isolation can be misleading. Remember cost is not the be all and end all for log cabin foundation details! Whilst we all want value for money a cheap foundation which subsides over time, will prove a very costly mistake. Always get an engineer to check your foundation designs and if you are doing them yourselves never try and skimp on this area! Select materials wisely and make sure the construction details are followed properly and measures are taken to stop any moisture problems.